With a background in creative education, Ian has successfully produced and led a range of innovative experiential programmes using music, art, dance and drama, and developed major events extending over several days. He has fashioned activities with a wide variety of groups including educational and social institutions, environmental agencies, voluntary groups, churches and communities both in the UK and Eastern Europe. His work as consultant, trainer and programme developer in Eastern Europe has included a wide range of such groups, and includes businesses and local authorities. Such work aims to build capacity in new and existing organisations. The underlying purpose of all his work has been to assist personal ‘soft skill’ development as a means of improving social relationships and activity – to discover more of ‘who and what we are and what we may be’. Much of his work has focused on developing ‘journey’ as a training resource and extends over 3 decades, becoming the subject of detailed study for an MPhil degree. The results of this work have featured in a number of publications and have inspired participants to turn their experiences into artwork. 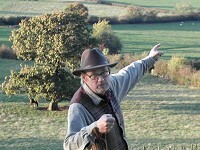 Ian has been described as someone who ‘takes people places’ both externally in the physical sense and internally through the encounters occurring during events. His work led to the foundation of Pathways Inspirational Development, and he is presently working with others in the network to develop the variety of programmes that the agency provides.